Recently, my wife and I relocated to Hot Springs, Arkansas. Hot Springs has a storied history that includes gangsters (including Al Capone) from Chicago, one of the oldest race track in the United States, and beautiful scenic lakes. We are still exploring the city and learning about the variety of entertainment and outdoor possibilities that now surround us. As St. Patrick's Day approached two days ago, my wife and I did not have any plans. However, early in the day, I spoke with an associate in Little Rock, Arkansas who told me the annual Hot Springs St. Patrick's Day parade. "It is the shortest parade in the United States," she said. Curious, I did a quick Internet search and found the official website for the World's Shortest St. Patrick's Day Parade. Two roads converge in the downtown area of Hot Springs. The connector between the roads, Bridge Avenue, is only about 100 feet in length. This bridge is considered the official parade route. Of course, parade floats have to enter and exit the bridge, so in reality, the parade route is longer than 100 feet. I told my wife, "We've got to go to this!" While she did not share my excitement - partly because parades in our previous small town were usually not impressive - she consented to go. 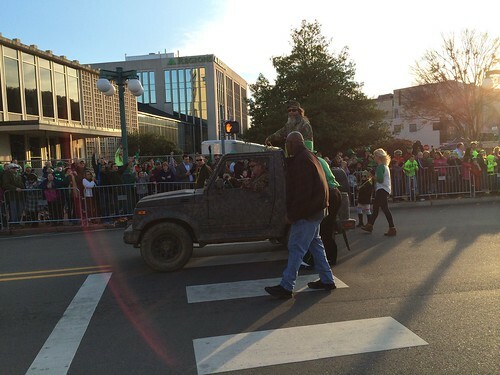 The official parade starter was Mountain Man from the Duck Dynasty television show. Rather than a continuous stream of parade floats, marching bands, and kilt-wearing "Irishmen," the floats paraded in fits and starts. One float would come by followed by 5-10 minutes of delay before the next float. After about 30 minutes, we departed, having satisfied my curiosity. After we returned home, I thought about the parade and how it could have been improved. I am not a parade organizer, but I know what I like and those around me - who complained that last year's parade was so much better - like. Keep a steady pace. The reason that circuses typically feature three rings is so that there is always action. While Ring 1 is performing, Ring 2 is getting ready. While we were at the end of the parade route, I'm pretty sure that the staging on the front end must have been confused for the delays we encountered. Stay true to the requirements. In my opinion, the most successful parades (Macy's Thanksgiving Day Parade and the Rose Bowl Parade) have several marching bands from high schools and colleges (actually playing, not just holding their instruments), baton twirlers, and performers providing entertainment. These "requirements" for a successful parade would have greatly improved the success of the Hot Springs St. Patrick's Day Parade. Stay consistent from year to year. The ability to reproduce a successful experience is key. Several people around me complained that the pace was much slower than last year. If people know that an entertainment experience will be good (think Broadway play) there is a great chance they'll return. As I thought about these tips for a better parade, I realized that these also apply to conducting business presentations. If a presentation lags, attendees will quickly reach for their cell phones. Understanding the purpose of the presentation will help keep you focused. Continually improving your ability to present will create a reputation - whether you are presenting to office workers, virtually, or to thousands of people. I hope that you will keep these tips in mind, whether you are planning a parade or a presentation.